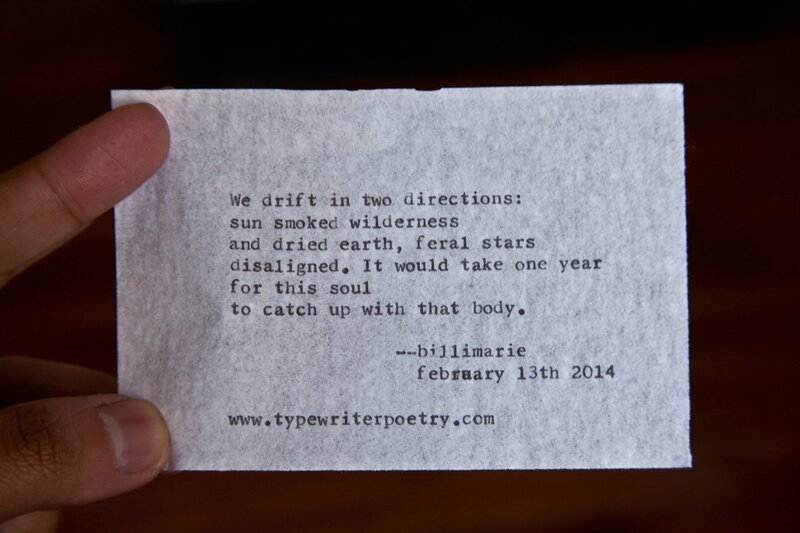 Last week, I gave away free Valentine’s Day love and admiration poetry at the Mid-City farmer’s market. A huge thanks to Moisés for giving me an amazing box of onionskin typewriter paper last year for my birthday…this was the first time I’ve used it. Love at first feel. The translucent, texturized, fragile essence made for a perfect poem this Valentine’s Day. Here’s one of many poems I wrote during downtime. to catch up with that body. * I have no idea if I was going for “misaligned” or “disarrayed”…I remember both were in my mind while typing, hence the typo, because I liked the meaning behind wild and casually cluttered stars being out of alignment with not only each other, but every other surrounding element as well. This is a really sweet and very powerful poem. Speaking from a long term relationship that often sees me and my partner on different sides of the globe I find the idea of drifting away but being reunited later oddly reassuring.